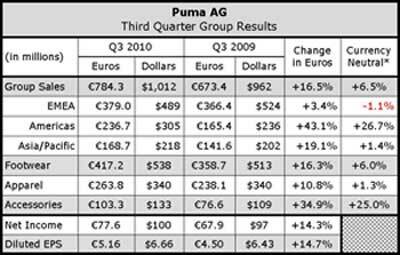 Puma AG belted out robust third quarter results, prompting it to hike its 2010 forecasts for sales and profitability. The performance provided an ideal setting to unveil its ambitious five-year growth plan. Its “Back To The Attack” program calls for boosting annual revenues to €4.00 billion by 2015 from €2.46 billion ($3.49 bn) last year. Sales will continue rising at a “high single-digit” pace until 2015, driven by restructuring Puma into a more lifestyle-oriented brand, developing brands such as Cobra Golf, pursuing e-commerce, and more aggressively targeting emerging markets. Margins are expected to remain stable, particularly with much growth focused in emerging markets. As part of that plan, Puma said it will take full control of its Chinese retail joint venture in January by acquiring the 49% minority stake it does not own. Surprising some, Puma indicated it will only “selectively” consider making acquisitions. The Puma brand is expected to drive 90% of growth, with non-Puma brands – including Cobra Golf, Tretorn and any future acquisitions – accounting for just 10%. Regarding distribution, wholesale is expected to fall to 80% of its total sales by 2015 from the current 84% as online and other direct-to-consumer expands. E-commerce is expected to grow to 8% of sales from 3%. Retail is expected dip to 12% of sales from 13% of sales now. Core categories will drive 80% of Puma sales growth until 2015 and other categories – including golf, outdoor, kids wear and sport fashion – the remaining 20%. Apparel and accessories are set to outperform footwear. By the end of 2015, footwear is expected to account for 50% of sales versus 54% currently, apparel for 35% versus 33%, and accessories for 15% versus 13% now. 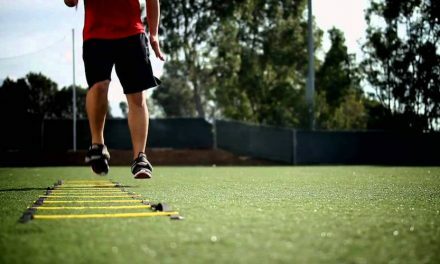 Core categories – team sport, running, training, fitness, motor sport, and lifestyle  will be the focus. Regarding acquisitions, Puma plans to explore acquisitions “pretty much to any three-digit size” in terms of millions of euros. Puma can spend a maximum of €100 million in 2011, Zeitz said. The acquisitions would have to either strengthen the existing portfolio through complementary assets or enable Puma to enter adjacent market segments. “The focus ideally should be on growth brands that at least have a CAGR [compound annual growth rate] that is comparable to the five-year plan that we have laid out so far, so high-single digits as a benchmark…” Zeitz said. On Oct. 18, French parent company PPR SA, which holds 71.6% of Puma shares, said Puma will become the main brand of a new Sports & Lifestyle unit. The unit will complement PPR's luxury portfolio which includes Gucci and Yves Saint Laurent. Zeitz will become executive chairman at PPR and run the new unit. A search for a new CEO for Puma has been initiated. In the third quarter, earnings rose 14.2% to €77.6 million ($100 mm). Revenues rose 16.5% to €784.3 million ($1.01 bn). Currency-adjusted consolidated sales were up 6.5%. Footwear rose 6.0% currency-neutral to €417.2 million ($538 mm), and Apparel sales improved by 1.3% to €263.8 million ($340 mm). Accessories sales jumped 25.0% to €103.3 million ($133 mm), which derives from organic growth as well as first time consolidations such as Cobra Golf. Regionally, the Americas grew strongest with 26.7% currency-neutral growth while Asia Pacific advanced 1.4% currency-adjusted. EMEA was off 1.1% in currently-neutral terms. For 2010, Puma forecasted sales growth in the “mid- to high-single-digits,” up from the previous forecast of “low- to mid-single-digits.” Gross margins are now expected to widen rather than be unchanged. One blip to the positive developments was its admission last week that “irregularities” at its Greek joint venture will cause the company to write off as much as €115 million. About €15 million will be charged against this year's results, with the remainder applying to prior years. Citing the initial findings of an independent audit, the Greek joint venture partner and members of the unit's management are suspected of committing “a series of criminal acts.” New local management has been installed and the irregularities have been halted. Still, a restatement of earnings will cut 2010 net income by about €20 million, Puma said. At the analyst meeting, Zeitz predicted 2011 would mark a turning point for the firm. The same €4 billion growth target has been in place since 2005, but the global financial crisis has derailed expansion efforts. “Puma has gone through challenging times over the last couple of years, but we feel that the time has come to close that chapter at the end of this year and turn over a new page,” stated Zeitz. 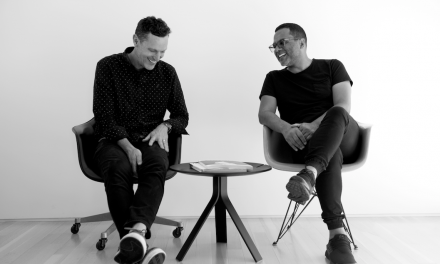 Two Former Nike Executives Join Forces To Form CO-Lab.